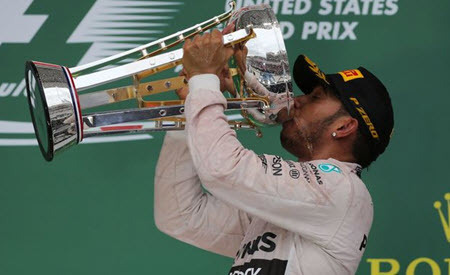 Lewis Hamilton has recently claimed his fifth Formula 1 World Championship title, making him the second most successfully F1 driver of all time. The 33-year-old driver became the third athlete in history to win a total of 5 world titles. He now matches Juan Manuel Fangio, the Argentine legend, and is only two titles behind the extraordinary Michael Schumacher. Lewis Hamilton only needed to finish in seventh position at the Mexican Grand Prix on Sunday to claim the championship, even if Sebastien Vettel from Ferrari managed to win. However, Vettel only managed to place second in the race behind the sensational Max Verstappen even though he had a strong race. Hamilton had a difficult race in Mexico, battling with tyre problems throughout the race, but he still managed to finish in fourth, one position from the podium, which was more than enough to claim the biggest achievement of his career. Once the race was completed, Hamilton performed a series of doughnut spins before waving to over 135,000 fans in the crowd. The Mexican Grand Prix was a clear reminder of what could have been for Sebastien Vettel, as both Valtteri Bottas and Lewis Hamilton suffered with excessive tyre wear which caused them to fall back in the field, giving him the perfect opportunity to attack aggressively on the Red Bulls in the last few laps. However, it was far too late for Sebastien Vettel as his season unravelled during the summer with multiple errors from both the team and driver. Mercedes and Hamilton were far below their high standards which they set for themselves in the beginning of the season. However, they managed to win 6 out of 7 races, starting with the German Grand Prix and ending with the Japanese Grand Prix in early October. This was enough to seal the deal for Hamilton and Mercedes.